Tres Leches Cake is not a dessert I grew up with. In fact I’d never even heard of it until three years ago when it suddenly seemed to be everywhere, including the freezer case at the grocery store and the local vegan restaurant. Yes, you read that right — vegan tres leches cake. This was the trigger. I figured if vegans would go to the trouble of making a milk-free version of “three milks cake” then the cake must be pretty darn good. The first recipe I used was from Recipezaar. It was posted by a cook who got the recipe from her Mexican housekeeper, Chela. That plus the many high ratings was the reason I chose it. It was so good that I never bothered with another recipe……until yesterday. 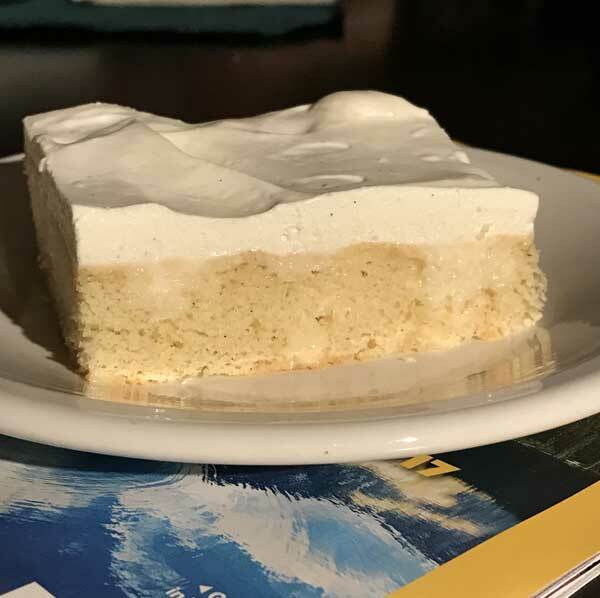 There are lots of variations on tres leches cake, but basically it is a dry cake soaked in a mixture of different milks, one of which is usually condensed. Sometimes it’s topped with meringue, sometimes whipped cream. The recipe I chose this past weekend was adapted from an old one in the Houston Chronicle (link is dead now). Is this better than Chela’s? Well, I’d have to try them side by side. It tasted almost the same to me, however, I liked the fact that I wasn’t relying on mix. Would I make it again? Heck yes! Of course now I’m thinking I need to try some restaurant versions. Update: This is my version of the recipe. The old version called for a full tablespoon of baking powder rather than 2 teaspoons and did not call for vanilla. 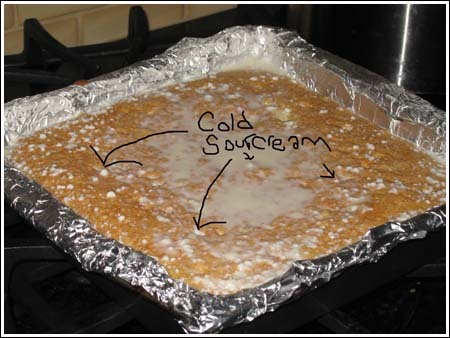 The topping called for 12 oz evaporated milk, 14 oz condensed milk, 2 cups whole milk and 2 full cups of sour cream. I found that to be a little too much, so I reduced the milk and sour cream. In addition, the original was topped with a meringue that was spooned over the cake before serving. I skipped that and used sweetened whipped cream. Preheat oven to 350 degrees. If using a glass pan, use 325 degrees F. Grease a 9x13 inch pan. For a thicker cake, you can use a 9x12 inch pan. Sift flour with baking powder and set aside. In a large bowl with clean beaters, beat egg whites until foamy. Gradually add sugar and continue beating until thick and white. Beat in yolks, one at a time. With a heavy duty scraper, fold in flour mixture and milk; mix well but don't beat. Pour batter into prepared pan and bake until edges are golden brown, about 30 to 35 minutes. Remove from oven; let cool on a rack. Prepare Three-Milk Topping by combining all 4 ingredients (I guess this sort of makes it Four Milks Cake!). Using a skewer, make little holes all over the cake. 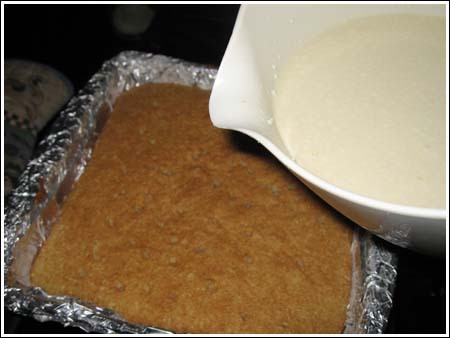 Gradually pour mixture over cake and let sit until all mixture is absorbed, 20 to 30 minutes. After it has sat for 30 or so minutes at room temperature, go ahead and refrigerate it. Prepare Whipped Cream Topping Chill cream, bowl and beaters thoroughly. 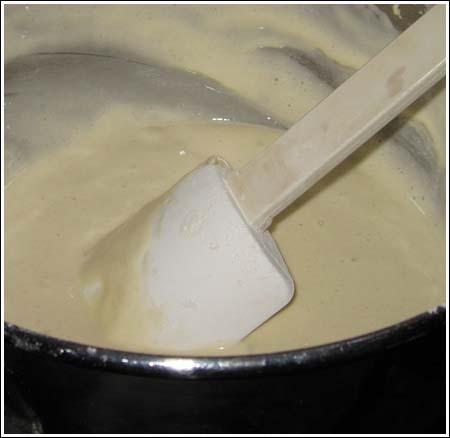 Beat cream with electric mixer until it begins to thicken. Gradually add sugar and vanilla and beat until stiff peaks form. Cover cake with whipped cream with a spatula or knife. Chill until ready to eat (tastes best the next day). Topping, cut cake into squares and serve, or spread Whipped Cream Topping over squares of cake. Cut cake and serve. Or cut the cake in squares and top with whipped cream when it is served. I don't think I've ever mentioned this, but my favorite tool for mixing is a heavy duty scraper. The one I liked best is from Pampered Chef. I don't sell Pampered Chef, but I get invited to lots of PC parties and this is one of the things I purchased and now recommend. The big, strong, spatula really shines in recipes like this where you are folding whipped egg whites into batter. It has a larger surface area and won't cut into as many of the air bubbles. This is what the cake looks like before being soaked. It’s very dry and doesn’t have any added fat. And here’s the cake soaking up some of the liquid. I used cold sour cream and it formed unattractive lumps. To remedy the situation, I warmed the soaking liquid a bit and stirred it up until smooth. The hot cake eventually melted the lumps you see here, but in the future I will use warm sour cream. Thank you. I have a Hispanic student in a class I teach who was going to bring her mom’s authentic recipe (she was going to have to translate it), but couldn’t because she didn’t get a chance to talk to her mom last night. I thought I’d try this one because, like you said, it doesn’t come from a mix, and neither did my student’s. I also wanted to offer that she said her mom often cuts the cake in half like in layers after it has soaked and adds fruit to the middle. The cake would have to come out spongy, rather than crumbly, to do that. She also referred to the batter as “bread” which I thought was interesting. Thanks for the help. Hi Andrea, the link is on the word “Recipezaar”. Sometimes it’s a little hard to tell where the links are, so here it is. I’m looking at this 3 years after-the-fact, but would like Chela’s recipe. I cannot find the “links” mentioned. Can you send it? this is my favorite dessert. Glad you liked it….even though you didn’t use the syringe ;). Dulce de Leche is a good topping, but it’s also great with fresh strawberries. There are a few different ways to make dulce de leche, but I’ve only used one method and I thought the result was just okay — not worth the trouble. Ok, I’ve tasted the cake now…and it’s good! Very moist and delicious. I didn’t use a syringe though, because I’m NOT a nurse. I attempted to make a homemade dulce de leche sauce, using a recipe from Food Network….a show called, “The Surreal Gourmet.” It turned into a disaster though, so I had to go buy some from the store. I guess I’m a little confused on what real dulce de leche is. Don’t forget to let it soak. It took mine a while to soak up all the milk and then of course, it was quite moist. Make sure you keep it in the refrigerator for a while and serve it chilled. I have the cake in the oven now. I’ll take a square of it before I send it off with Robin tomorrow. This cake may be too exotic for this area of Ontario. We’ll see. Emilie, I guess we have the same sense of humor. Every time I see that recipe, that one line makes me laugh. That’s probably one of the reasons I chose it. Given this recipe (above) and Chela’s (linked from above), I’d choose Chelas. thanks for posting this smaller recipe. I’ve always wanted to make one, but the thought of making such a big one didnt thrill me. I think I might try this tomorrow. Robin needs a dessert to bring to a dinner thing on Thursday. Yes, yes that’s the one. On Congress next to The Great Outdoors! Ah! Habana. Now I have an excuse to go there. Also, don’t worry. This cake will defintely absorb your milk because it is so very dry. I think Amy D. is referring to Habana, and I have to agree- their tres leches is YUMMY. I tried making it myself once, and I ended up with a cake that wouldn’t absorb a bit of milk, regardless of how many holes I poked in it. I made the impermeable cake. Maybe I’ll try again with your recipe. I cut most of the ingredients by about third. Mathematically, that’s different than making 1/3 of the recipe. So no, don’t triple it! The best bet, should you wish to make a 13×9 inch cake, is to just use the Houson Chronicle recipe (the first recipe in the link) and add a little vanilla to the cake batter. Looks great! So if I wanted to make it in a 9×13, should I just triple everything? Or could you post the original or send it to me? Thanks a bunch! If it makes you feel any better, we weren’t home! Also, the tres leches cake really needs to sit overnight. waa! I rode right by your house. 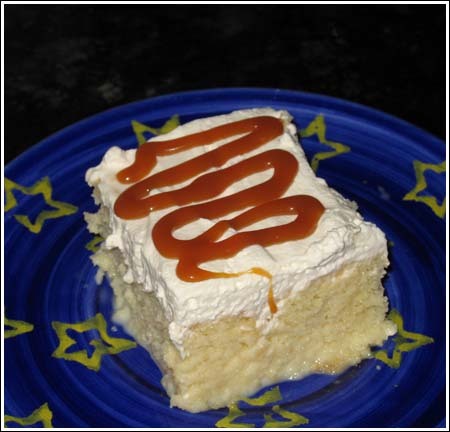 I’ve never had tres leches cake, I could have tasted it! My neighbor loves the Tres Leche cake at a Cuban restaurant here in Austin. I will find out the name and let you know. Tracy, that is too funny! I had no idea the Bake-Off thing was on TV again. I wish I’d known. We were in a hospital room in Houston with my grandmother. If I’d known it was on, I would have turned on the TV for her. She gets a kick out of that stuff. Tell your daughter hi. I’m sure Fuzz would love to meet her. Saw you on the Bake-Off again last night! It was fun to watch you win and to see you in your kitchen with your daughter. Thanks, Anna. I will make this next week after Passover.